What is BioEnergy Healing and how does it work? Our bodies have an amazing capacity to self-correct. For example, when we get a cold or a mild flu our body can fight it off in just a few days. However, chronic and long-term illness occurs when our ability to self-correct fails. Just as with a car, when a few parts get worn and additional stress is added, such as a long journey or a very bumpy road, a trip to the mechanic becomes necessary. The same happens with our bodies and a good doctor will spot the problem and do whatever he or she can to repair the damage. We understand that a car needs petrol and that we need the fuel of food and water to keep going but we forget that there is another mysterious vital force necessary to keep the engine running and that is electricity. The part of us that takes in and interprets information and which in turn feeds that input back into the body through subtle energetic forces is our mind. How we think and how we feel about ourselves and about life has a very real effect on the physical body because what we think directly influences the flow of energy in the body. In the past this energy was only seen as spiritual in nature because no one could prove it was there, however the latest quantum physics findings recognize that this subtle energy field exists. For thousands of years healers have said that this energy must flow well in order for people to be healthy and happy. Science can add to this understanding. Because bodies are made up of subatomic particles in constant motion, it is now more logical in quantum physics terms that many physical ailments would manifest first in this energy body. The view in Energy Healing is that stress and painful emotions, for instance, can cause energy to get stuck or depleted, inhibiting the body’s natural healing processes. As within, so without; mind and body are mirrors of each other and there are many physical maladies that are in fact symptoms of problems with the energy field. By harnessing the power of the mind-body connection, healing is something that simply promotes our own natural ability to heal our own selves. The therapist’s focus will always be on improving the emotional and spiritual feeling of the client, rather than on a physical outcome. From the therapist’s point of view, any improvement in a physical condition is a very nice side effect of treatment and a sign that the client is learning how to take control of their own health. 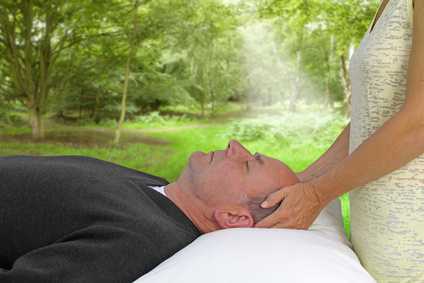 The energy healing on offer here is gentle and non invasive. Depending on what is being treated, you may either stand for a part of the session or remain seated, with your clothes on and all you have to do is relax. It normally takes four sessions to clear and rebalance the system and then it’s up to you if you want the odd top up session now and again. It’s as simple as that! My approach is basically a synthesis of many years of training in different areas of healing. The BioEnergy methods I use are the Domancic Method (see page for more information) and a more powerful soul purpose/ life purpose alignment bioenergy method based on mystery school teachings and taught to me in 1997. I also use a specific sound therapy during the session both with recorded music and with tuning forks. These sound frequencies are very specific healing frequencies. During a session you may feel different sensations such as tingling, heat, cooling, pressure or pulling sensations and you may experience flashes of colour or light. All of this is normal in a healing and cannot affect you adversely in any way. The client needs to be relaxed and free of anxious or worrying thoughts so part of the Fusion process can include work on correcting thinking patterns or on developing guided visualizations specific to the client if it is felt that a client needs such work done before or along with energy healing treatments. For clients who are experiencing problems, that come in part from what I see as faulty thinking, I usually incorporate The Work of Byron Katie which I see as an integral tool of the mind part of the mind-body-spirit approach of the healing process. Sometimes stressful thinking settles down after the first or second energy healing session. At that stage I will check in with the client to see if there are thoughts that are still causing problems and at this stage we might then opt to do a few Work sessions along with energy treatments. Please look at The Work of Byron Katie page on this site to get more information on this. How many sessions should you have? Four sessions are recommended because that seems to be the required amount to clear the system. It is normal during sessions two and three to feel changes in mood, slight irritability or even giddiness! This again is normal and a sign that your system is kicking in and helping you to change any lifestyle patterns that are not helpful to you. Healing sessions are spaced a week apart. When doing purely the Domancic Method the sessions are one a day, four days in a row. Many complementary therapies concentrate on relaxation and reducing stress. They can help calm your emotions, relieve anxiety and increase your general sense of health and well being. And doctors and researchers are getting more interested in the idea that positive emotions can benefit your health. Having a positive outlook is an important part of coping with illness for most people. Even if your doctor tells you that your illness might be difficult to cure, of course you will still want and hope for a cure. This is normal and often a very important part of coping with illness. Some people use complementary therapies as a way of helping themselves feel positive and hopeful for the future. Another reason people may use complementary therapies is because they get a lot of comfort and satisfaction from the feeling experience that a complementary therapy usually offers. Giving time to a your emotional, psychological and spiritual needs can be a very positive aid to wellness. A holistic healing therapy will not offer medical diagnosis, rather it works with the medical opinion of your doctor and looks at the energy of the ‘whole person’ and any thoughts or fears that might be affecting your physical, emotional and psychological health.